This wine was an epiphany wine for me back in the day. It was the first time I associated fresh peach as a descriptor in wine. It was not long after moving onto our lifestyle block and were relishing the harvest from the old Golden Queen tree. Now, over two decades later, the still tight cork of this old wine is eased out gently with the Ah-so, the colour peach golden in the glass and the taste mature and mellow, but I still taste Golden Queen together with apricot and nectarine and there’s still a fresh lively zing. Unbelievably well preserved. Such a treat. I sip on the wine and recall the joyous times I enjoyed this old label Jewelstone Chardonnay in February with a fresh Golden Queen peach. The label says ‘Vinted and bottle by Mission Vineyards, Church Road, Greenmeadows, Napier. Produce of New Zealand.’ Alcohol is 13.5%. I’ve been trying to work out when my favourite art label changed to something more contemporary but that eludes me. 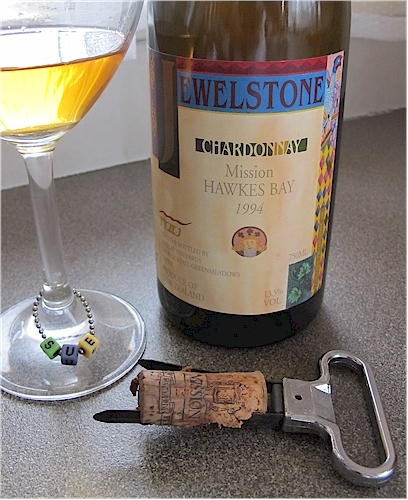 This entry was posted in #nzwine, cellar-aged, chardonnay, hawkes bay, NZ regions and tagged 1994, Mission Estate by Sue Courtney. Bookmark the permalink.